This is my first Tuesdays with Dorie post, the raison d’etre for Confectiona’s Realm. I’m so excited! 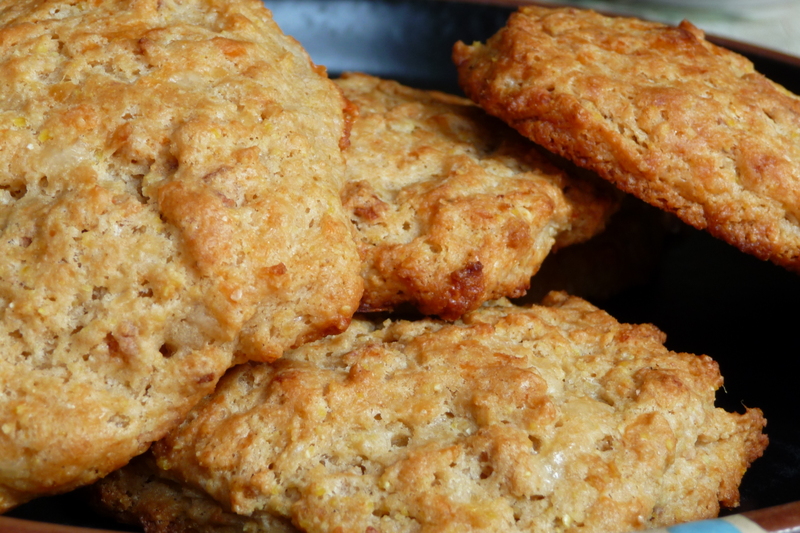 Dorie’s recipe is for Apple Cheddar Scones, but I didn’t have any dried apples. I did have dried pears, so there we are. I love making scones for breakfast, because I can mix all the dry ingredients the night before and measure out all the add-ins. Then in the morning it takes 10 minutes to get them into the oven, and 20 minutes after that we’re eating. You can find the recipe at The Floured Apron or in Baking: From My Home to Yours, by Dorie Greenspan. And if you want to see what other bloggers have done with the recipe, check out the TWD blogroll. This entry was posted Tuesday, July 1st, 2008 at 1:39 pm	and is filed under Uncategorized. You can leave a response, or trackback from your own site. Congrats on your first week with the TWD’ers Pear & cheddar sounds good – but hey, I love pears! Welcome to TWD! I understand a little what your husband was saying, mine were a little dry for me, but I think it is a great recipe. I almost used dried pears, then found some dried apples in the store when I was doing some last minute shopping. I’m glad to see that combo turns out well, too! And welcome to TWD! Dried pears, really? Where’d you find those? Your first TWD, and it looks wonderful – Congrats! I found the dried pears at Trader Joe’s, which has a pretty good selection of dried fruit. Thank you all so much for welcoming me to the group! Wow- the dried pears sound so good. I bet they really made these great. They look yummy! welcome to TWD! great looking scones! Welcome to the group! Great job! Pears sound really good in these…and they look lovely. Welcome. I want to try strawberry jam on mine now! Great job! Welcome to the mad mad world of TWD. Great job on your scones. It never occurred to me to prep the ingredients at night and have a quick weekday breakfast. Now I know. Thanks for sharing that! Welcome to TWD! Dried pears … delicious. Lovely scones — dried pears sound delicious. Welcome!